Political views get lots of funny labels. You can be left-wing, right-wing, liberal, conservative, neo-liberal, a fascist, a communist or an anarchist. I wasn’t about to be tricked into thinking that the Liberal party is necessarily for liberals but I wasn’t exactly sure what all these labels meant. While I was looking for answers I found a very useful site called Political Compass that has a clever way of classifying your political position. Rather than using a linear right-left scale it plots political views in two dimensions: economic and social. The x-axis is the economic dimension, ranging from Communism on the left (an entirely state-planned economy) to Neo-liberalism on the right (a completely deregulated economy). The y-axis is the social dimension, with Authoritarian (Fascism) at the top and Libertarian (Anarchism) at the bottom. There is a test you can take, which plots your political position on the compass. The site also includes analysis of political parties and leaders so you can see how your views compare with theirs. I’ve combined the positions of some political leaders given in two separate charts on the analysis page of the Political Compass site into Figure 1. I’m happy to report that my dot on the compass was closer to that of Gandhi than Hitler or Stalin or Thatcher. The Australian federal parties at each of the two last elections (2007 and 2010) have also been plotted on the Political Compass site. Only the four major parties (Labor, Liberal, National and Green) were shown for 2010. The chart for 2007 includes Family First, Democrats and One Nation too. In Figure 2 I have combined the charts for 2007 and 2010. 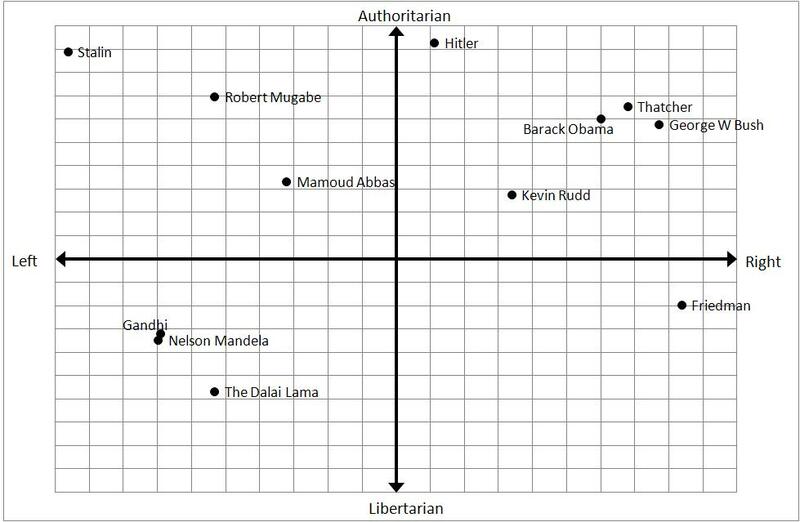 From Figure 2 it can be seen that most of the parties are located in the right-wing authoritarian (top right-hand) quadrant. These parties accounted for 84% of the vote at the 2010 Federal election. There is only one party in each of left and right-wing libertarian quadrants and there are no parties in the left-wing authoritarian (top left-hand) quadrant. I suppose this should reflect the Australian population but I wonder if it does- if the political positions of all Australians were plotted on the compass would they fall most densely where the parties that received the most votes are plotted? 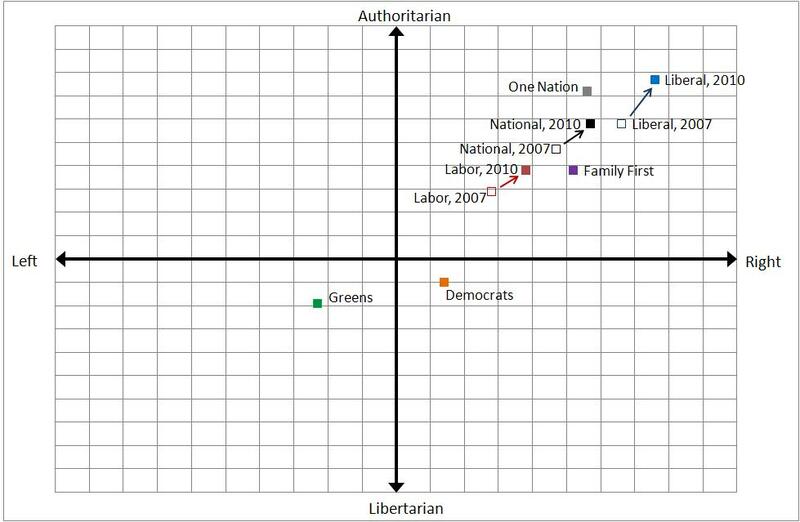 The other thing I noticed was that between 2007 and 2010 the Labor, Liberal and National parties became more right-wing and authoritarian (they moved closer to the top right hand corner). The Greens were plotted in the same position in both years. It is interesting to think about how the movement of the Labor and Coalition parties further towards right-wing authoritarian affected their votes. In 2007 Labor won the election easily but in 2010 it only managed to form a minority government. The Liberal-National coalition vote increased but not as much as the Green vote. You may be wondering where the Communists would be plotted. I was left wondering that too. Perhaps if they received more votes (The Communist Alliance party received 0.01% of primary votes in the House of Representatives in 2010) they’d get their point plotted too. 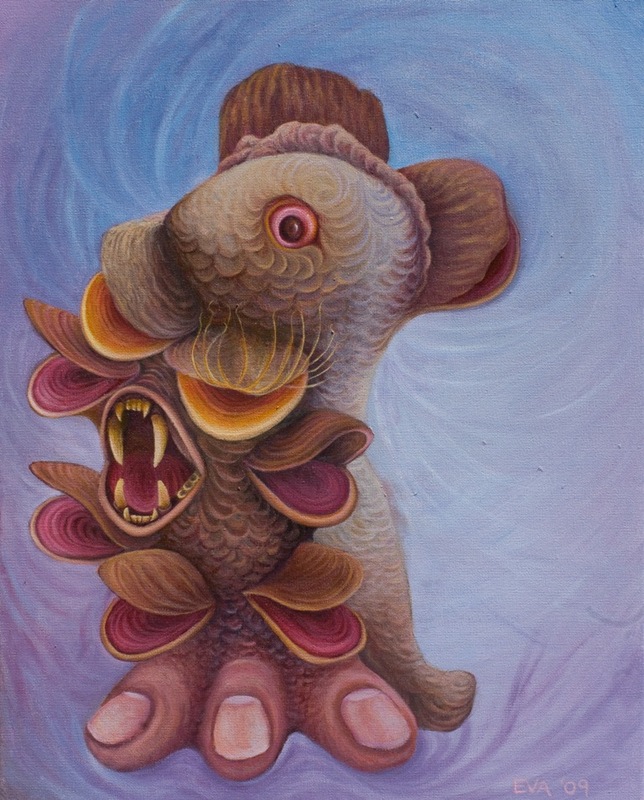 This entry was posted on Monday, June 11th, 2012 at 5:36 pm	and tagged with anarchism, authoritaran, communism, fascism, Feature article, Gandhi, Happiness, Hitler, left, libertarian, Mandela, neo-liberalism, Obama, political compass, right, Rudd, Stalin, sustainability, Thatcher, The Inkling, three big questions and posted in Features. You can follow any responses to this entry through the RSS 2.0 feed.